Andouillettes, and becoming what you eat - Salut! In John Grisham's novel The Last Juror, the young newspaper editor in Ford County, Mississippi is horrified when barbecued goat and mouth-burning moonshine are served by a lawyer to guests at his cabin in the woods. But even goat - "tough and smothered in sticky sauce which, I suspected, was applied in generous layers to counter the taste of the meat" - seemed divine by comparison with the other delicacy thrust into his plate. This was a morsel of food so vile that its aftertaste had to be killed by fiery shots of the moonshine. Before I reached the page where the origins of the offending item were revealed, I had worked out for myself that the novel's hero was talking about one of my favourite meals in France. Andouillette. Or, and this is perhaps where the true health warning is required, he was talking about the American version. Traditional andouillette is made from the colon and the stomach of pig. In modern times, contents vary and normally contain intestines of pig, cow and/or calf. It is not to be confused with andouille sausage, which is much spicier, but more mild in animal-derived smells. I'd realised from Grisham's narrative - it's a good read, by the way, especially for journalists and, more generally, those with a liking for American fiction - because the titbit was described to him as "chitlins" - or hog's guts - and I knew, of course, that andouillettes translate as chitterlings. "The texture was rubbery, the taste was acrid and foul," reports our delicate young newspaperman. "The smell had a barnyard essence." Wikipedia is even tougher on the French variety, noting the disgust its aroma has been known to arouse among foreigners.....and then the description gets really nasty. But maybe the Ford County chitlins were a long way from being the real thing as understood in the sort of places I do my dining. 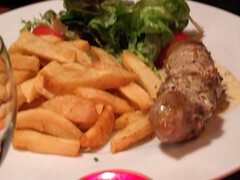 "American andouillette," we are assured, " is quite acceptable to the American palate." My predecessor as the Telegraph correspondent in Paris, Philip Delves Broughton, declared in the paper once - probably more than once - that he detested andouillettes. Now Philip is an exceptionally good writer, but would find it hard to shake off the charge that he was, to put it at its most neutral, highly selective in his appreciation of France and the French. So I took mischievous delight in announcing when I succeeded him that in so far as the Paris correspondent had a say in such matters, the newspaper's policy had changed: in Orwellian Eurasia/Eastasia fashion, the strongly anti-andouillette editorial line had been replaced by a solid pro-andouillette stance. All harmless knockabout fun, of course, unless that expression of culinary incorrectness was what did for me in the end. But it establishes me as a committed andouillette lover, wherever they come from and however they are supposed to smell when served hot, preferably with the chips French restaurants can, but do not always, do so well, and never without generous dollops of moutarde de Dijon. One of my minor treats, when travelling around la France profonde in search of stories that told people a little about this country and its people, was to allow enough time before the train back to Paris for a quick andouillettes-frites fix at some brasserie or other near the station. It may seem a dish less suited to southern climes and ways, but I still allow myself the occasional lapse. Yet it is difficult to escape the conclusion that I may be in a minority, among non-French consumers at any rate. This hapless individual is unlikely to be rushing to my support, so vivid will be his memories of stumbling across a plateful so "icky beyond words" that he was reduced to cutting his blameless sausage into small pieces to spread around the plate to look as if he'd eaten it like a man. But I would not be surprised to learn that it took him one glance at my contrasting view to confirm that I have indeed become what I eat.